The Exchange Brewery | Williamson Williamson Inc. The Exchange occupies a heritage building, built in the 1880’s that was once the site of Niagara’s first telephone exchange – hence the name, and numbering system for the beers that harkens back to the telephone dial. The building was restored back to the original by removing the decorative trim, restoring the facade, and replicating the original wood windows. In order to accommodate the space and equipment required for the program change from clothing store to brewery, a two-story addition was constructed at the back and an 18′ deep fermenting cellar excavated, increasing the space from 1,400 square feet to 3,500 square feet. The complexity of the project was not only how to fit full size brewing equipment into a 19′ wide building, but involved managing rezoning, heritage approvals, archaeological test digs, and the presence of a large aquifer feeding the Niagara River that was discovered to run under and around the new foundations. 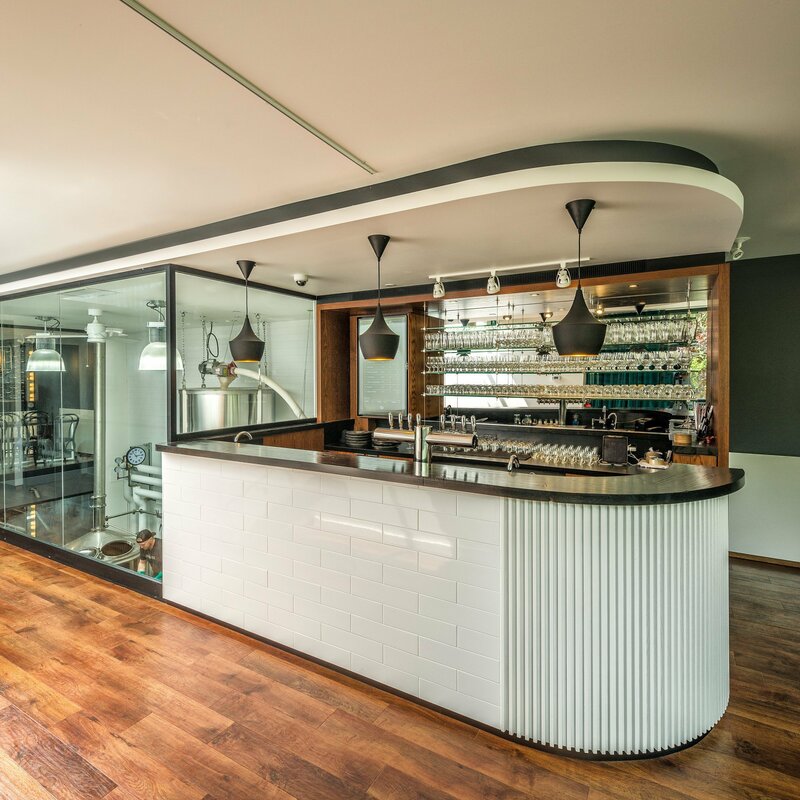 The brewery houses a 10-barrel brewhouse with five 20-barrel fermenters and eight 1,000 liter serving vessels running straight to the draft lines from the cold room. 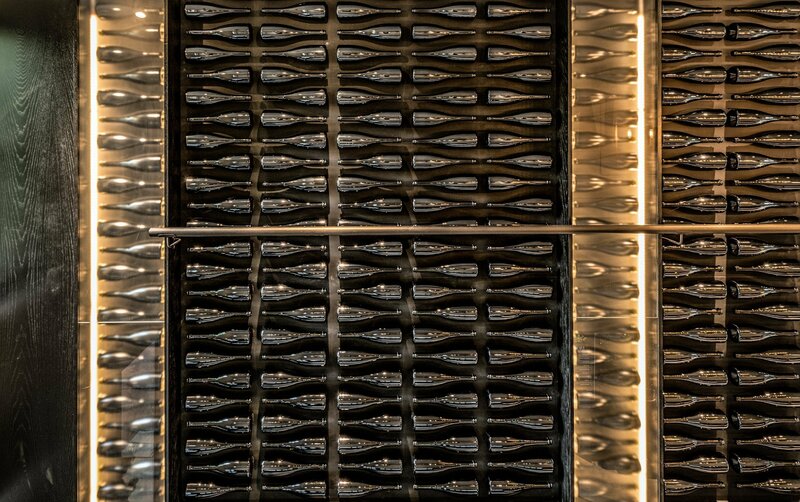 The cellar is equipped with two 1,100 liter German-made Hungarian oak Foeders and 50 French oak wine barrels where the tannin, yeast, and bacteria left in the wine barrels add an extra layer of flavour to the sour beers that anchor the array of niche style beers that The Exchange brews. 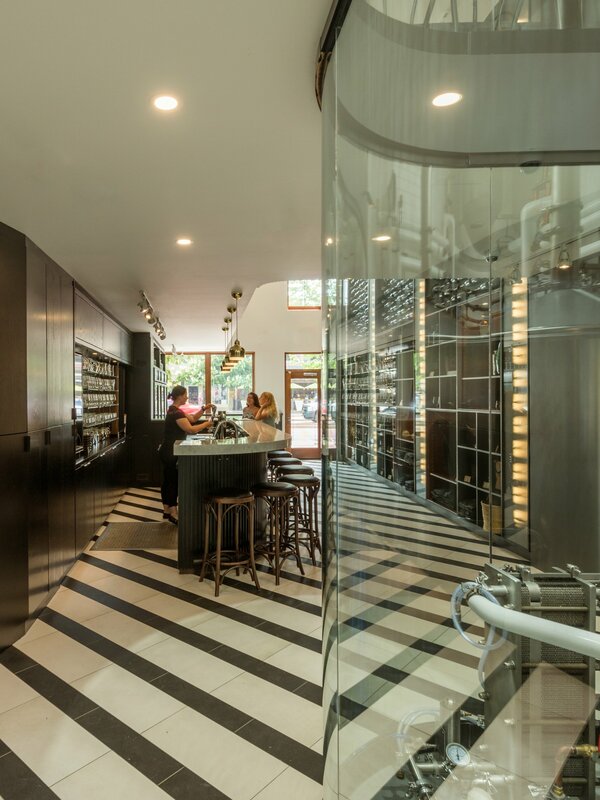 Carving out a double height space at the entry allows the tasting bar to feel expansive in a relatively small space. 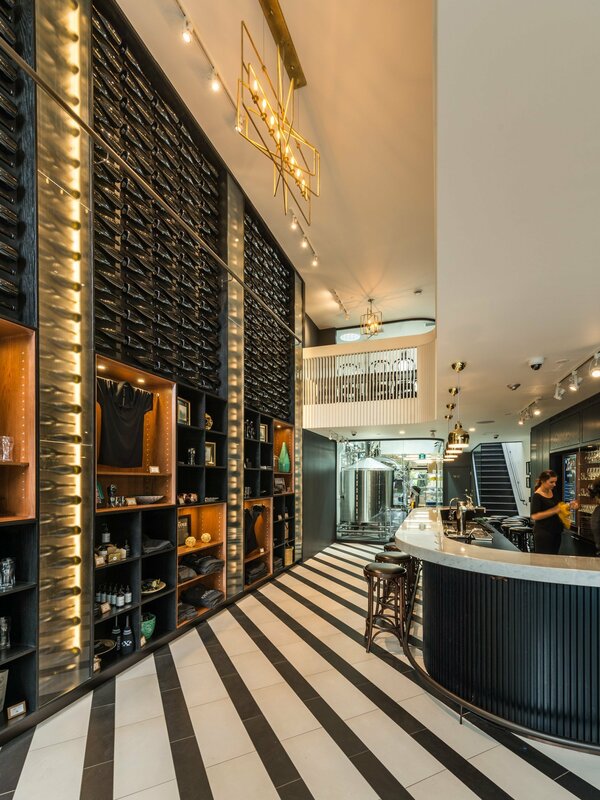 The entry feature wall is comprised of black and walnut stained oak display cabinets topped with a black bottle wall, showcasing the champagne shaped bottle that is the signature of The Exchange. The black bar with white marble top and the back and white striped floor lock the expression of the space to the signature branding that links all the elements of this emerging business together. 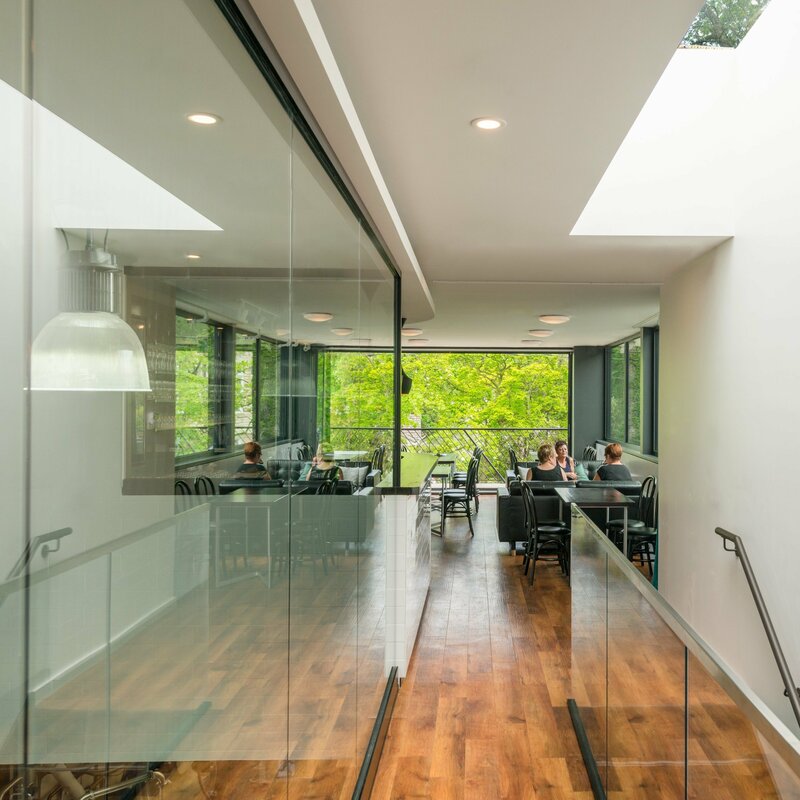 A second double height space in the centre of the building situates the glazed brewhouse as a focal point and conduit for light. 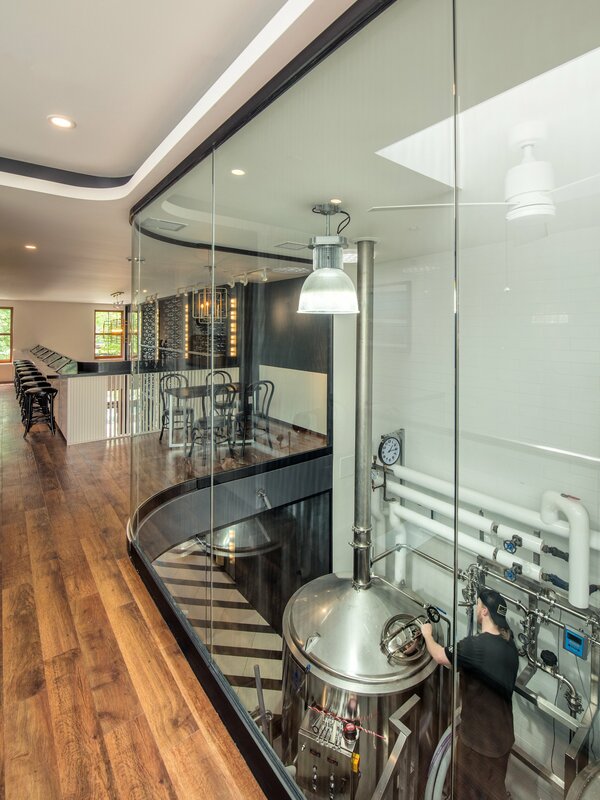 Large skylights above the brewhouse and stair illuminate the tanks and draw patrons in from the street. 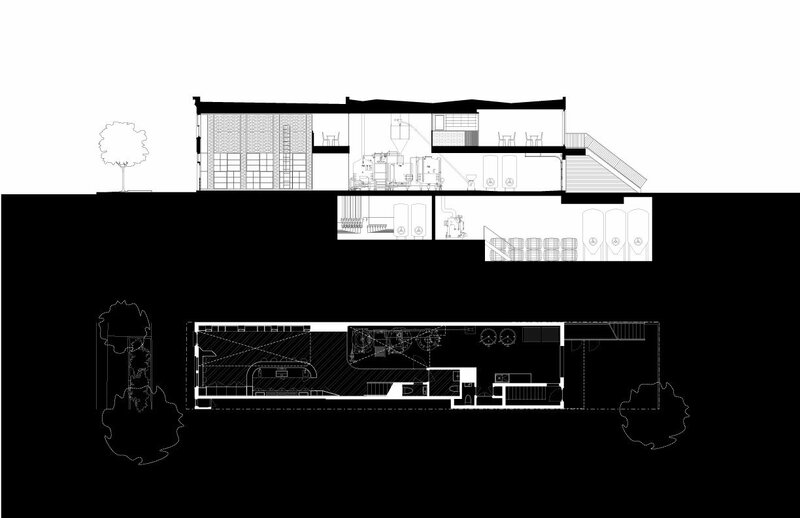 The carved volumes are less solid than void, creating two distinct bridge spaces that flank the brewhouse and create a mezzanine bar and gallery to the tasting room below. An intimate garden room at the rear of the second floor contains a second tasting bar and opens fully to an exterior deck and an expansive view of the Simcoe Park. 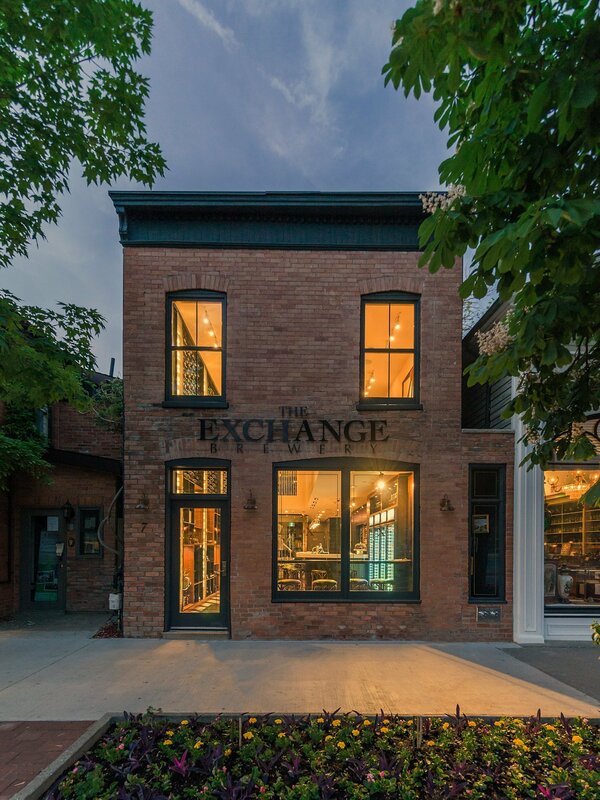 Dedicated to investing in the local economy, The Exchange employs Niagara College graduates and students – five from the brewing program and two from the wine program, The Exchange has the ambition to change craft brewing from rustic to the refined. 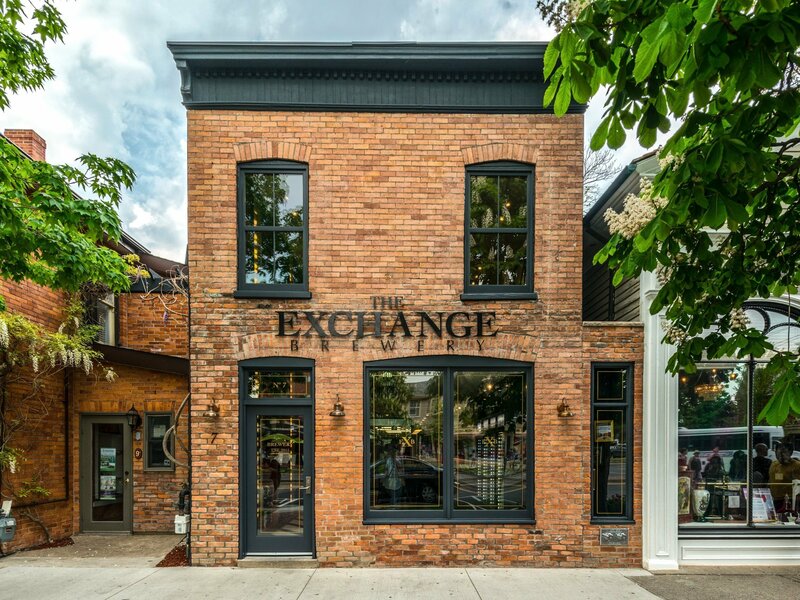 The Exchange is a new brewery and tasting room located in Niagara-on-the-Lake’s Old Town district. The Exchange occupies a heritage building, built in the 1880’s that was once the site of Niagara’s first telephone exchange – hence the name, and numbering system for the beers that harkens back to the telephone dial. In order to accommodate the space and equipment required for the program change from clothing store to brewery, a two-story addition was constructed at the back and an 18′ deep fermenting cellar excavated, increasing the space from 1,400 square feet to 3,500 square feet. The complexity of the project was not only how to fit full size brewing equipment into a 19′ wide building, but involved managing rezoning, heritage approvals, archaeological test digs, and the presence of a large aquifer feeding the Niagara River that was discovered to run under and around the new foundations.